Peace, T.R., Rampa, F. 2013. ECDPM talks to H.E Tumiisime Rhoda Peace, Commissioner for Rural Economy and Agriculture African Union (AU), on what the African Union Year of Food Security means for her. GREAT Insights, Volume 3, Issue 1. December 2013 - January 2014. Why did the African Union choose 2014 as the Year of Food Security, and what are the outcomes expected from this initiative? 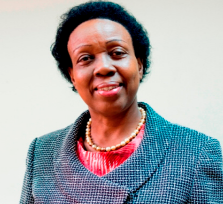 Rhoda Peace: Over the last decade, through the instrumentality of the Comprehensive Africa Agriculture Development Programme (CAADP), African agriculture and food security concerns have been elevated on the policy agenda at national, regional, continental and global levels. Thanks to such concerted actions, the performance of Africa’s agriculture has been encouraging – with annual agricultural GDP growth having averaged nearly 4% since 2003 – well above the agricultural share of GDP growth rates for the past several decades. It is absolutely necessary to sustain the momentum of such positive change and development taking place in Africa well into the next decade. It is in this context that African Union (AU) Heads of State and Government took the decision declaring 2014 the Year of Agriculture and Food Security in Africa, and marking the 10th anniversary of CAADP. It is, indeed, an important milestone and an opportunity that should be seized in the resolve to continue to prioritise agriculture and food security in policy and implementation to generate concrete results and impacts for the citizens of Africa. In congruence with this labelling, the Africa Year of Agriculture and Food Security will be commemorated across Africa, in Member States, Regional Economic Communities (RECs), Continental organisations, and, of course, at the AU Headquarters in Addis Ababa, Ethiopia. It will be a year that gives opportunities to communities, state and non-state actors in Africa to interact, express their voices on what works in agriculture and chart the focus and targets for the next decade. The process will facilitate these voices to contribute towards setting the agenda for sustaining the CAADP momentum, which forms the basis for African leaders to recommit themselves to realising the vision set out in 2003 for a food and nutrition secure and poverty-free Africa. It is also remarkable that the Africa Year of Agriculture and Food Security is to be commemorated in 2014 following, and overlapping with, the first half of the year, the continued celebrations of the 50th anniversary of the Organization of African Unity (OAU)/AU, particularly at a time when the thrust of the African Union Agenda 2063: “A Shared Strategic Framework for Inclusive Growth and Sustainable Development” will be adopted. Truly, the agenda of agricultural transformation is strategically positioned to provide enormous opportunities for an inclusive and sustainable development in Africa. This decision was reached after a debate amongst African Heads of State who had proposed that 2013 be marked as the Year of Agriculture and to mark ten years since CAADP was endorsed by AU Heads of State in Maputo in 2003. The Heads of State Debate noted that in 2013, the African Union would be celebrating 50 years since the establishment of the OAU, now the African Union. The Heads of State argued that agricultural issues are so important and they should not be missed or allowed to be submerged in the 50 years celebrations. This is how they came to the decision of the year 2014. What will the AU’s Year of Food Security mean for farmers on the ground, in particular family farmers? How will the AU Year of Food Security relate to the UN’s Year of Family Farming? The Year of Agriculture and Food Security has been informed by a number of studies, lessons and experiences. For example, the Sustaining the CAADP Momentum study noted that the smallholder farmers remain the bedrock and will continue to influence agricultural development on the continent. In Africa, you cannot talk of agriculture without linking directly to smallholder farmers because they constitute over 90% of all farming households. So, the African Year of Agriculture is for farmers more than anyone else. The UN’s Declaration of 2014 as the Year of Family Farming will augur well with the Africa Union Year of Agriculture in Africa. We will work with the UN system to ensure that the commemorations are used not only to celebrate but more so to chart the future of agriculture for the next decade. And to ensure that whatever innovations and initiatives come into play, the smallholder farmer and the family farm remain at the centre. 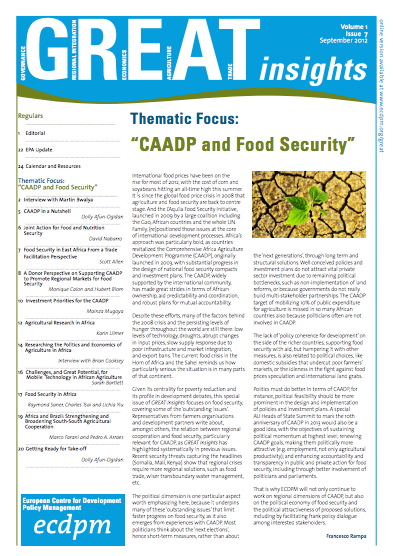 How will the AU’s Year of Food Security advance the CAADP agenda? Africa has recognised that enhanced agricultural performance is key to growth and poverty reduction through its direct impact on job creation and increasing opportunities, especially for women and the youth, on food security and improved nutrition; and on building resilience. This is due to both the heavy weight of agriculture in African economies and livelihoods, and the strong linkages that agriculture forges with other sectors. 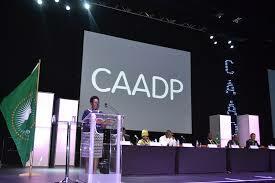 So, 2014 is an important year for CAADP. Why do I think this is so? Just as I mentioned earlier, in 2003, the AU Assembly of Heads of State and Government adopted the Maputo Declaration on CAADP setting broad targets of 6% annual growth in agricultural GDP, and allocation of at least 10% of public expenditures to the agricultural sector. The African leaders signalled their intentions to achieve these targets through collective actions across the continent focused on improving agricultural planning and evidence-based policies, scaling up investment to implement these plans and policies, and harmonising external support around Africa-owned plans. There is much appreciation from many that a decade of CAADP experience has demonstrated that Africa as a region has a well-crafted, home-grown, country-driven framework guiding policies, strategies and actions for agricultural development and transformation, which has been instrumental in raising the profile of agriculture at the centre of the development agenda at national, regional and global levels. This has in turn facilitated mobilisation and alignment of multi-stakeholder partnerships and investments around national agriculture and food security investment plans that have been developed through the CAADP process. To what extent is CAADP contributing to a change in national agriculture policy making and planning? What has the CAADP changed at the level of farmers and has it promoted African agriculture development? 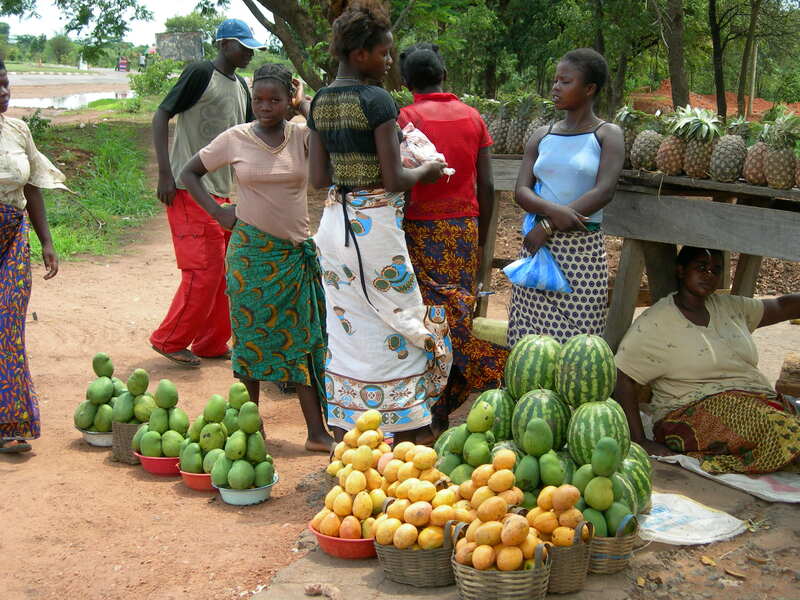 Is there anything that CAADP could do differently? In fact, CAADP has also encouraged and facilitated evidence-based planning and commitment to institutional and policy reforms with a sense of mutual accountability for actions and results, as well as for demonstrated African ownership, and for active engagement of partnerships of multi-stakeholders rather than leave the process to governments and donors. Mechanisms such as agriculture sector reviews at country level, and annual CAADP Partnership Platforms are increasingly being used as review and dialogue platforms in fostering accountability for results on agriculture performance. It is significant to note that to date, 36 AU Member States have signed CAADP compacts; 30 among them have developed formal national agriculture and food security investment plans – and these have become their medium-term expenditure frameworks for agriculture; thus resulting in improved agricultural planning and raising the prospects for the desired results and impacts. At regional level, four out of eight RECs have also signed Regional CAADP compacts out of which three have developed fully costed investment plans. 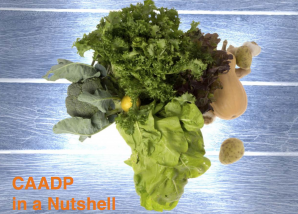 On average, public agricultural expenditures have risen by over 7% per year across Africa since 2003; nearly doubling public agricultural expenditures since the launch of CAADP. Why do we think these compacts and investment plans are so important? This is simply because what Africa lacks is not resources; neither is Africa lacking seeds, fertilisers or other forms of technologies. What Africa has been lacking are evidence-based policies; systems, credible institutions to better deliver services. Africa needs to focus more on accountability systems that can better guarantee use of own resources. This is what CAADP has been trying to put in place and it brings in a heightened role of political leadership in all this. Since one of the key principles of CAADP is to benchmark what is happening on the continent, CAADP has been supported by our knowledge support system Regional Skills and Knowledge Support System (ReSKASS) to put in place credible data and information for decision making. For example, demand for more clarity has been expressed in terms of further elaboration and refinement of the CAADP targets, and assessment of technical efficacies and political feasibilities for success as well as identifying key factors that define success in agricultural transformation. The AU Commission and the NEPAD Planning and Coordinating Agency (NPCA) have recently commissioned studies to try and provide some answers to these vexing questions. The outcomes of the studies are expected to provide an important input into the series of deliberations and mutual learning and experience sharing opportunities planned to span the entire Year of Agriculture and Food Security in Africa, marking the 10th anniversary of CAADP. The benchmarking has also helped us to understand where we stand today in terms of performance. Just as an example, annual agricultural GDP growth has averaged nearly 4% since 2003 – well above the agricultural GDP growth rates for the previous several decades. Several AU Member States have also achieved significant improvements in tackling the challenges of hunger, undernourishment and extreme poverty. It is important to note that in most African countries, it is the improvement of agricultural performance that can contribute towards the achievement of pro-poor growth. Studies have indicated that a 1% gain in GDP originating from agriculture generates a 6% increase in overall expenditure of the poorest 10% of the population. In contrast, a 1% gain in GDP originating from non-agricultural sectors creates zero growth. 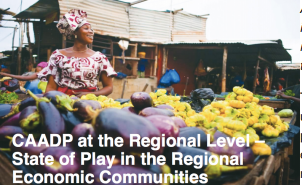 These experiences are strong indicators that inclusive growth, as advocated under CAADP is a process requiring sustained and concerted actions and efforts in application of quality policies, strategies, programmes, and investments driven by strong political commitment and leadership and fostering effective partnerships. It is, therefore, desirable that the next decade will build on this momentum to deliver in an accelerated manner, positive changes towards prosperity that directly impact on livelihoods of African citizens through an inclusive agricultural transformation process. 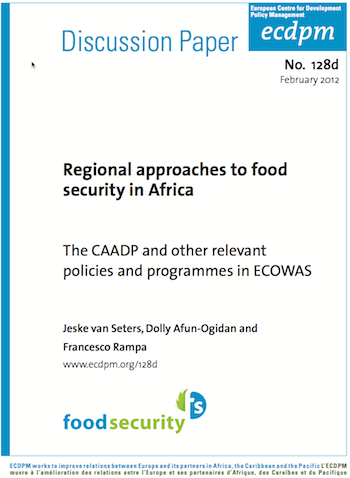 What should the Development Partners do differently/better for African Food Security? For example, in the context of CAADP, which improvements (if any) can be expected from the Multi-Donor Trust Fund support to CAADP in the next 10 years? First, and for the next decade, we want to pursue CAADP efforts differently. As such, we have developed a CAADP Results Framework that is comprehensive and beyond agricultural production productivity but to cover all parts of the value chain and support mechanisms that come with it. In practice, this will be the instrument that will rally all actors to pursue different efforts but are measured jointly and reported likewise. What we expect from different partners is to use or work with us in Africa and better harmonise their support, better coordinate their support and align to country-drawn and led priorities. The implementation of the CAADP Results Framework will require partners to do things differently because the instruments will call for supporting and reporting on country own policies and strategies. Specifically to the Multi Donor Trust Fund, alignment and harmonisation will be expected to be enhanced. As you may recall, this trust fund was established to support African institutions to better coordinate CAADP support. This has been done to some extent and will be expected to continue measuring up to the momentum generated. But as we move more into creating and supporting country actions for impact and results, we may need to see some of the support mechanisms targeted to country level. Some of these may need to support institutional reforms for ensuring better delivery of services. We may need to get into support to specific policy reforms in-country. We are currently discussing with other partners and our stakeholders on multi donor trust fund and so we will guide on the governance of this trust fund to better focus and help us to achieve better results for impact as we pursue prosperity for African citizens. What role will development partners from the emerging economies play during the AU Year of Food Security? What is the plan for engaging with them in the future, also in regards to CAADP where they currently play no part? We expect all partners to be on board in support of the 2014 Year of Agriculture. I should have indicated that 2014 is just a base year for the next decade and, therefore, will be used to engage and consult national, regional, continental and global stakeholders on what should constitute goals, actions and targets for the next decade. We call on non-traditional partners and those from emerging economies to come and we forge credible partnerships and bring in more private sector for investments in agricultural value chain. Private sector is going to drive agricultural transformation in the next decade. All efforts that are being put in place are intended to enable and create incentives and packages for investments for jobs and for wealth creation. We will support governments to better develop policies that can facilitate targeted investments. We want to ensure that agriculture is attracting others sectors for investment such as mobile phone companies, banks, energy sectors as well as infrastructure. This is going to be our campaign. Her Excellency Tumusiime Rhoda Peace is the Commissioner for Rural Economy and Agriculture at the African Union. 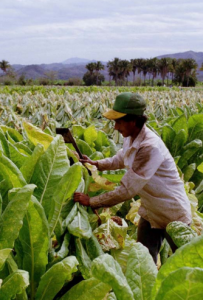 This interview was conducted by Francesco Rampa, Manager of Food Security Programme at ECDPM.